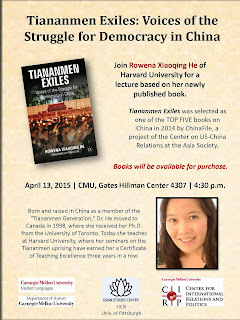 PennsylvAsia: "Tiananmen Exiles: Voices of the Struggle for Democracy in China" at CMU, April 13. 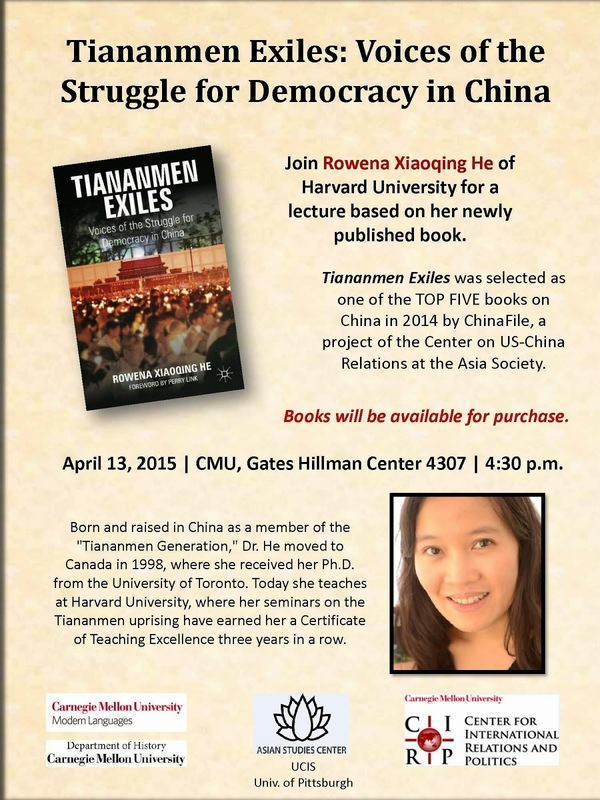 "Tiananmen Exiles: Voices of the Struggle for Democracy in China" at CMU, April 13. This moving oral history interweaves He's own experiences with the accounts of three student leaders exiled from China. Here, in their own words, they describe their childhoods during Mao's Cultural Revolution, their political activism, the bitter disappointments of 1989, and the profound contradictions and challenges they face as exiles. Variously labeled as heroes, victims, and traitors in the years after Tiananmen, these individuals tell difficult stories of thwarted ideals and disconnection that nonetheless embody the hope for a freer China and a more just world. The talk begins at 4:30 in 4307 Gates Hillman Center (map), and is free and open to the public.